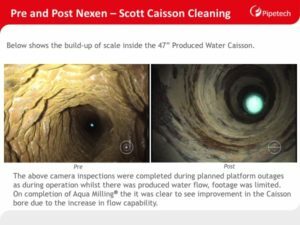 Pipetech were commissioned to deliver a single sourced solution for inspection, cleaning, coating and planned and programmed maintenance on Nexen’s Scott platform. The team of four, successfully completed the first stage to remove internal scale build up from the 42-inch produced water Caisson on the platform. Aqua Milling® technology was deployed 27 meters above sea level and recovered back to the 1.5 inch entry point, mitigating any chance of blockages. In total, the project took eight days to complete with a full camera inspection conducted during a planned outage to further confirm the results of the cleaning. The project required the team to mobilise quickly and remove the stubborn scale, whilst the platform remained in operation. This was done, negating the costly implications of shutting down production to complete the work. Carrying out the work whilst the platform remained in operation, driving efficiencies whilst maintaining asset integrity throughout the lifecycle of the Caisson. Delivering inspection, cleaning, coating and planned and programmed maintenance and repair scheduling, all managed by a single point of contact. A skilled and experienced team, providing the excellent customer service and surpassing customer expectations. The Aqua Milling® system has a proven track record in successfully removing the toughest of scale and blockages which other systems struggle with and has the ability to reach up to 600 meters in a straight line from a single point of entry. It can negotiate up to 20 directional changes. Pipetech is currently the only company licensed to use Aqua Milling® in the UK. "With our many years of caisson experience, we understand the importance of a proactive integrity management plan. Our Active Caisson Management service means we will continue to manage inspection on the Scott platform to monitor the caisson’s internal scale levels and intervene if required. This proactive approach is vital in today’s cost effective market"